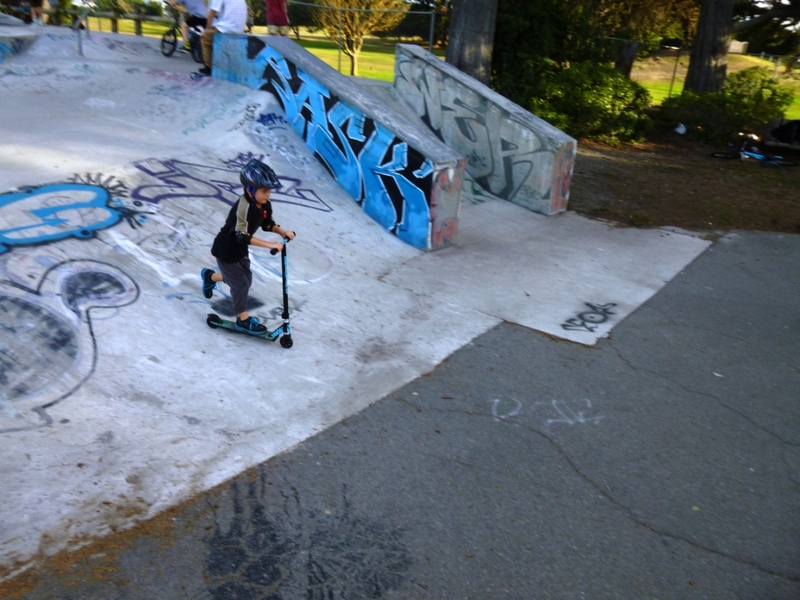 Thomson Park is a large recreational area in New Brighton – it has a skate park, big and little kids’ playgrounds, a flying fox, picnic areas, a sports field, and is opposite New Brighton beach. There’s a toilet a little way on from the little kids’ playground. See map below for Thomson Park location. There are some pretty cool trees with low branches to climb ( just watch out for broken glass around there). The Beach Cafe is nearby, and you might pass the Naked Baker on your way. There’s also a Wild Bean Cafe (BP) on the corner of Bower Ave and Travis Road. There are a few fish & chip shops in the vicinity. We visited Thomson Park in April 2015 (autumn). Flying fox – quite high. Lots of little kids sharing the skate space. Toilets – a little walk away. Does this still mean what I think it means? Thomson Park is located at 93 Marine Parade, New Brighton.